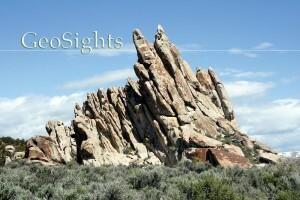 At Devils Playground, spires of rock greet the visitor. Introduction: Why take your kids to the neighborhood playground, when you can visit a playground that can inspire your sense of geologic adventure? 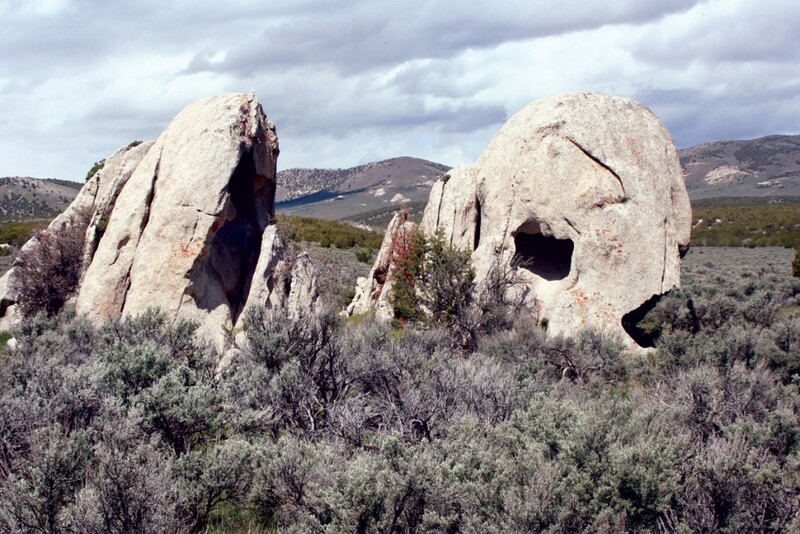 Devils Playground is not your typical playground at the park, but a playground of granitic rock weathered into fantastic forms and eerie shapes. 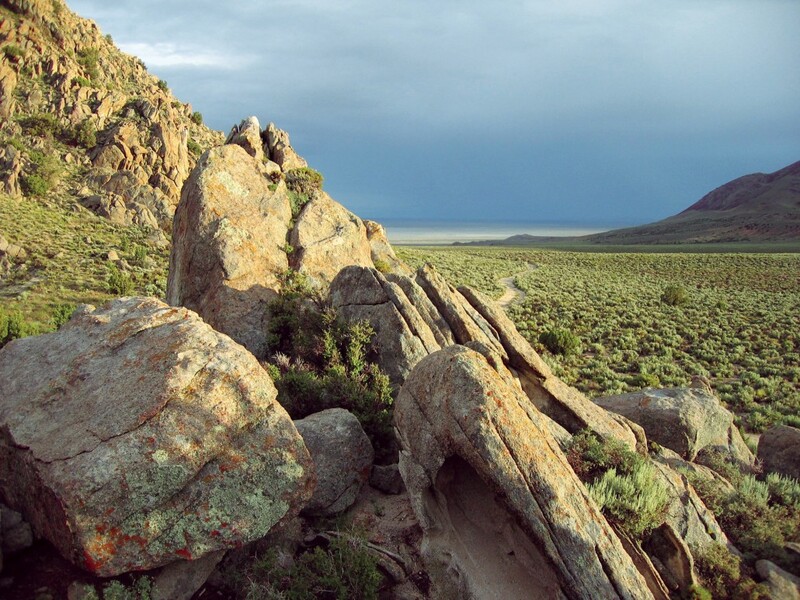 Located on Bureau of Land Management and state land, Devils Playground is a relatively unknown geologic curiosity found in a remote region of northwestern Utah. 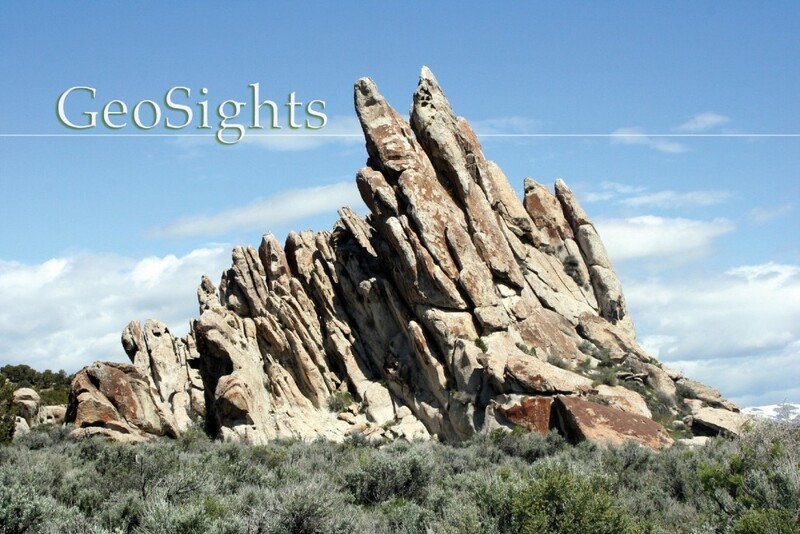 Geologic Background: Devils Playground consists of Tertiary-age (approximately 38 million years old) granitic rock formed from a cooling magma body that intruded overlying Paleozoic (400 to 300 million years old) sedimentary rocks. Known as the Emigrant Pass pluton, this intrusion covers an area of approximately 10 square miles in the southern part of the Grouse Creek Mountains. Later, small magma bodies intruded into the granitic rock forming pegmatites (coarse-grained igneous rocks with interlocking quartz crystals, usually found as irregular dikes or veins). The pegmatites are fairly common, several inches in thickness, and extend hundreds of feet. They represent the last and most hydrous (waterrich) portion of magma to crystallize. The pegmatites are easy to locate because they are more resistant than the surrounding rock, thus they resemble ribs and bones sticking out in relief. Basin and Range faulting and uplift of the Grouse Creek Mountains (approximately 13 million years ago) subjected the region to extensive physical weathering (surface water runoff and freeze-thaw), which over millions of years slowly peeled off the overlying sediments and sedimentary rocks. A thickness of roughly 3 to 6 miles of rock and sediment was removed before exposing the granitic rocks of the Emigrant Pass pluton. Once the rocks were uncovered, physical and chemical weathering (a variety called spheroidal or onion-skin) began attacking the rocks. In spheroidal weathering, joints or fractures create initial openings allowing surface water to access the rock from all sides. 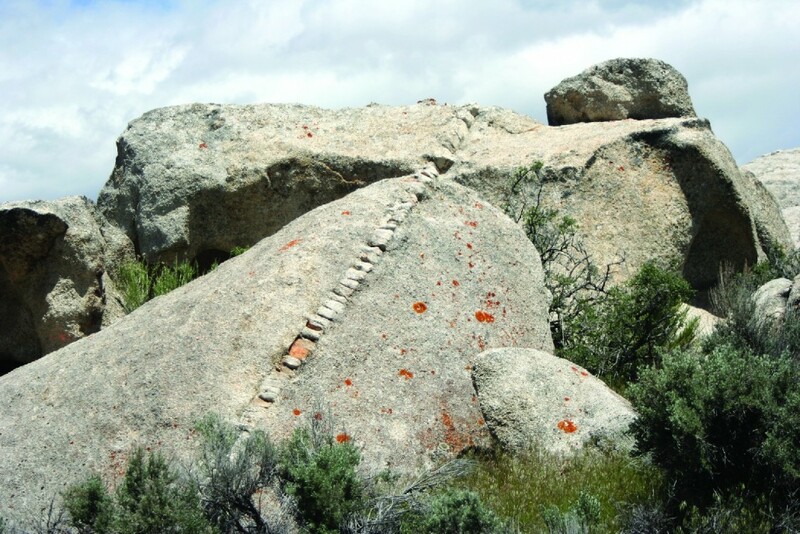 Water seeping along these fractures slowly decomposes or alters the mineral composition of the granitic rock, causing the rock to weather inward. As a result, rounded shells of decomposed rock are repeatedly loosened and peeled off the unweathered core like the skin of an onion. The rate of weathering is greatest along the corners and edges where fractures and joints intersect because they have a greater surface-area-to-volume ratio than the rock faces. All of the “devils,” alcoves, spires, arches, and small caves found at Devils Playground can be attributed to these physical and chemical weathering processes. Eventually, physical and chemical weathering will destroy all of these artistic forms of nature. 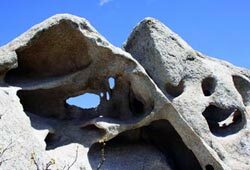 However, these processes will continue to sculpt new features as long as physical and chemical weathering expose granitic rock at Devils Playground. North Route: From the northern I- 15/I-80 interchange in Salt Lake City, head north on I-15 for 69 miles to Tremonton (exit 382). At exit 382 the freeway splits; I-84 continues to the northwest, and I-15 forks off and goes north. Travel northwest on I-84 for 37 miles to exit 5. Turn left (west) on Highway 30 and travel 16 miles to Curlew Junction (a junction with Highway 42). Turn left (southwest) and proceed 74.5 miles to the Emigrant Pass road. Turn right (north) and drive approximately 8.5 miles to the Devils Playground sign. Turn right (east) and proceed 0.2 miles to first granitic outcrops of Devils Playground on the right (south) side of the road. If you proceed on this road for several miles, the road will end up in the heart of Devils Playground. West Route: From the northern I- 15/I-80 interchange in Salt Lake City, head west on I-80 153 miles to Oasis, Nevada (exit 378). Turn right (northeast) on Nevada State Highway 233 (also Utah State Highway 30) for 57 miles to Emigrant Pass road. Turn left (north) and travel approximately 8.5 miles to the Devils Playground sign. Turn right (east) and proceed 0.2 miles to first granitic outcrops of Devils Playground.